Cut spaghetti squash widthwise into 2 inch segments, making sure to remove the seedy inside. Set on parchment paper-lined baking sheet and drizzle both sides with olive oil and sprinkle with salt and pepper. Bake about 40 minutes until tender at 400 degrees F.
Cook bacon at medium heat on stove until crispy, then remove from pan. Remove most of the grease, leaving about 1 Tbsp in the pan. Increase heat to medium/high, and pour in a dash of wine. Scrape and stir with a wooden spoon to get up all the tasty fond. adding more wine as it reduces down. Cook about 1 minute, then reduce heat to low. Mix in 1 Tbsp honey until dissolved. Chop bacon into 1 inch pieces and mix in. Mix in 4 to 5 cups fresh spinach, a handful at a time, until leaves have shrunk. Remove spaghetti strands from cooked squash with a fork. 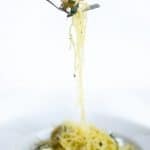 Combine spaghetti, spinach/oil mix, and small dollops of goat cheese, mixing until goat cheese has slightly melted and ingredients are evenly distributed. Serve with whichever wine you used in the deglazing process. Recipe from Live Eat Learn at https://www.liveeatlearn.com/spaghetti-squash-with-bacon-spinach-and-goat-cheese/.